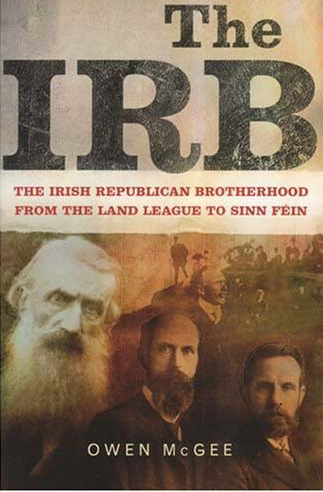 The Irish Republican Brotherhood, more popularily known as the IRB or the Fenians (technically the name of the American wing of the movement but eventually applied to all) were Ireland’s first democrats, Irish Republican revolutionaries who wished to bring freedom and democracy to Ireland at a time when neither existed. Advocating the use of force and politics, community activity and a free press, to achieve their aims they in all probability had a greater impact on the course of Irish history than any other movement up to Ireland’s War of Independence (which they themselves helped spark). From their formation in the mid-1800s to the eventual success of the 1916-1923 Irish Revolution (and beyond) the Fenians were at the heart of Irish politics, society, economics and culture not just at home but across the globe. McGee’s new history, though perhaps flawed in his analysis of the early 20th Century IRB and its movement to an “Irish Ireland” or Gaelic Republican ideology (McGee partly sees citicism where many others would undoubtedly see a natural and nescessary evolution of an already existing strand in Irish Republican ideology), will undoubtedly remain one of the defining IRB histories for decades to come. Ireland’s first democrats, and one of the world’s truly great democratic revolutionary movements, finally have the modern history they so richly deserve. Those who want to know more about the IRB should also look up Marta Ramón’s A Provisional Dictator: James Stephens and the Fenian Movement.